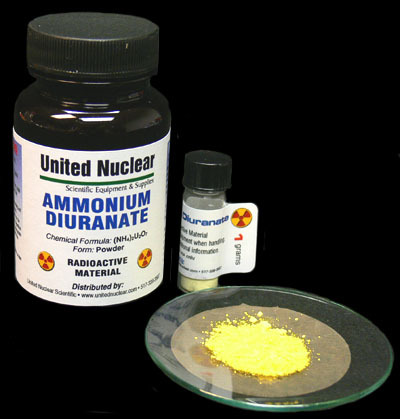 Ammonium Diuranate (also known as Yellowcake) is a radioactive compound of the metal element Uranium. It is the original Uranium compound known as Yellowcake. These days, a variety of Uranium compounds are called Yellowcake but they can be green, black orange or yellow. Ammonium Diuranate is mildly radioactive and primarily emits Alpha and Beta radiation. Historically, Yellowcake was used to produce unique colors in ceramic glazes until being banned for use as such. This is a product of natural Uranium - it is not depleted. Like most heavy metals, Ammonium Diuranate is chemically toxic. Inhalation of any dust particles can be hazardous. Ideal for collectors of those experimenting with Uranium compounds. Comes as shown above, small vial packed in standard chemical bottle. Vial contains 1 gram of Yellowcake. Caution: Use normal laboratory safety precautions when working with Ammonium Diuranate. Inhalation or ingestion of the Yellowcake dust particles may be harmful. Note: adult signature required upon delivery.